Over the past 8 months, I have become more and more interested in investing. Not only did I give the topic of investing a more prominent position on this site (by having at least 1 post per week on the topic), but I have also been doing a lot of research on the topic. When I started investing, I didn’t know that much about investing. In the beginning, I didn’t even know the difference between a stock and ETF. Who does when they are first starting out, right? I often think that this uncertainty is the very thing that keeps young adults from investing when they are young. They feel overwhelmed when they start looking at investing and immediately throw in the towel. They rationalize their decision by saying they have plenty of time to invest for retirement and ultimately they put it off another few years. This is one of the biggest mistakes any investor can make. Instead of putting of your investments as a young adult, you should start putting money away. My wife and I were hesitant at first because we knew we were putting our money at risk, but it got easier with time. Investing doesn’t have to be as difficult as it is often portrayed as. With the development of technology and new types of funds (like indexes or ETFs), it’s entirely possible to invest your money properly without knowing how to select an individual stock. In fact, I was lately introduced to a new investment broker that is making it even easier on investors. Betterment is an investment broker. For those unfamiliar with that that means, it is a place where you can invest in the stock market. It isn’t like any other broker, like Fidelity or Vanguard. Instead, it uses advanced technology to help you automate your investments. They put a huge emphasis on allocation. Normally, when people talk about allocation or diversification in their investments, they talk about a tedious, time-consuming task to make sure they have enough of their money in different types of investments. With Betterment, you can literally re-allocate your investments with a push of a button. Actually, it’s more of a dial. You can click and drag one way or another to adjust your allocation. If you want to invest aggressively, you move it one way. If you want to be more conservative, move it the other way. Below is a screenshot of how easy it really is. This is one of the most attractive features to Betterment. Not only is Betterment easy to use, but it is also cost effective. They now have an annual fee of .15%-.35% depending on your balance. Based on what you are getting with this low fee, it is a great way to invest. For example, my wife and I are using target retirement funds in our Roth IRA’s (not with Betterment). We had set them up prior to me learning of Betterment. We are currently paying an expense ratio of about .7% per year. It’s not the lowest management fee, but it is easy to use. While I don’t want to go through the hassle of moving my IRA to another investment broker, if I had to do it all over again, I’d think twice about where I invested my money. In fact, I’m thinking seriously about rolling over an old 403(b) into an IRA with Betterment (more on that later). 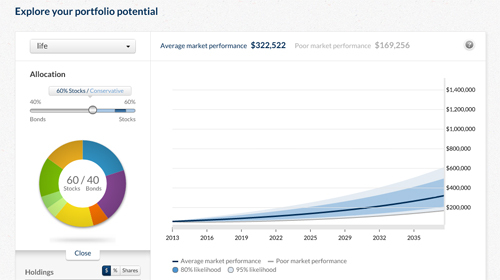 Betterment offers a competitive option for investing your money. Betterment can offer these lower rates because they are a tech-based company. They don’t have to cover the expenses that brick and mortar brokerages have. Simple and Easy Way to Invest – You don’t have to sweat over which investments you should buy. All you have to do is set the allocation of stocks to bonds. Fast and Easy Way to Diversify Investments – Betterment’s use of technology is one of their biggest assets. It lets investors change their entire portfolio with a click of a button. Built-In Technology to Set Personal Goals (and track progress) – Betterment also uses previous market performance to predict future performance. You can create a goal and Betterment will continue to track your progress. This is extremely helpful because it lets you know if you need to invest more money. Cost-effective Way to Invest – The low annual fee and the cost of the ETFs still average less than many actively managed mutual funds. While I’m a huge fan of the automation tools to invest, you are choosing to sacrifice some features that you would have with a more traditional brokerage. Lack of flexibility in types of investments – Unlike a traditional brokerage account with someone like Fidelity, you won’t be able to purchase an individual stock. All of your investments with Betterment will be in ETFs. The reason they do this is to make it easy and cost-effective for investors to move in and out of investments. It’s not necessarily a bad thing unless you really want to buy an individual stock. Easy to Confuse Predictions with Guarantees – This second disadvantage is more of a personal position, but the predictive element with their online tool can be misleading. In fairness, Betterment is clear to emphasize that these are not guaranteed returns, but I can’t help but think that I will have this projected amount if I meet the contribution requirements. Investors with Betterment need to remember that nothing is guaranteed. Betterment: Who Should Invest There? An inexperienced investor who does not know enough to make wise investment decisions. Someone who does not know how to manually diversify a portfolio. An investor who is too busy to actively manage their portfolio. An investor who prefers to keep things simple. An entrepreneur who knows their time is worth more to them managing a business than trying to actively manage their own portfolio. Someone who needs simplicity to start investing. As a financial advisor I am always interested in finding places to refer prospective clients for whom my services might not be appropriate for any number of reasons including the level of my fees and the size of the prospect’s portfolio. In looked at Betterment about a year or so ago as one potential place to refer such prospects and suffice it to say I wouldn’t ever suggest it as an alternative that anyone should investigate. Thanks for your feedback, Roger. Do you care to elaborate on why you wouldn’t suggest Betterment? The tools to invest for someone who does not know how to actively manage a portfolio seems to be a huge win for me. Roger, I don’t mind comments with links as long as it leads to a better discussion. I’m glad you’re willing to disagree, but I’m not sure I understand what it is that you don’t like about their investment model? I noticed your critique of them that they did not recognize the importance of financial advisors, but is there something that you don’t like? I’m not saying it’s perfect, but it’s a great option for many investors, in my humble opinion. I’d love to hear if you have any specific concerns with the investing strategy, fees, etc because those seem like viable options to me. I would like to politely disagree with Betterment being a bad investment decision. Betterment is a firm that assists with basic asset allocation using Modern Portfolio Theory in low cost ETFs. They charge a fee on top to help you with your asset allocation. Do people NEED Betterment? Absolutely not. You can invest in ETFs on your own and avoid the fee. Is there a reason to use Betterment? Absolutely. If you are not comfortable with asset allocation decisions, these guys are all CFAs (Chartered Financial Analysts) and are ready to help. They have low account minimums which means I can tell my mother in law to invest a small amount and she can spread money across many ETFs, verses other brokerages which would require say a 3k min to invest in an S&P ETF. I also have had the opportunity to work with Jon Stien, the CEO of Betterment and fellow Columbia MBA, and I like where his head is at. He truly wants to make investing easier and accessible for those who maybe can’t afford an adviser, or just want a little help. They aren’t claiming to be the end all be all of investing, but they do offer solid advice from guys who have been working on the Street and in financial services for years on asset allocation if that is what you want. It is a limited service, but it definitely makes sense for some. @Lacy I could care less if Betterment declared war on financial advisors or anyone else. My issue was the complete inaccuracy of how they did it and the less than half-baked apology that they issued. This is not all that much different than saying somebody of a particular ethnicity or race did something bad to me therefore all people of that group must be bad. Absolutely there are some bad apples in the financial advisory world, but even a cursory read of the study cited in the original Betterment post would show the flaws in using it as they did. It seems like Betterment management left this to some social media type to be their attack dog and didn’t like being called out for doing it. The biggest issue, however, is why attack anyone? From a business perspective I look for places and services to refer folks for whom my services are not a good fit cost or scope wise. I really wanted to like Betterment for that reason. As a business wouldn’t it have made much more sense for Betterment to find “good” advisors (perhaps like my fee-only colleagues at NAPFA) and cultivate a relationship? 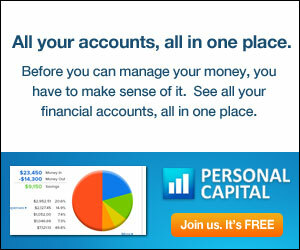 The last time I saw Betterment’s average account size it was a pretty low $3,000 ish. Perhaps this has grown a bit, but even if its doubled it would take a lot of these small accounts to make any money. To me their efforts to say “… hey look at us…” really served to shoot themselves in the foot. This seemingly poor business judgement is the main reason that I am so down on them. This is business school 101 in my mind, if they don’t get this it really makes me wonder about how the company is managed. I can’t comment on “what they did, or how they did it”. I am completely unfamiliar with any of their old promotional efforts or PR. I only know about the current business model, which I can see would be a benefit to a certain consumer. I hope that you are right for the sake of their clients that things have improved. To me, however, Jon Stein is the constant between then and now and he not only OKed what was done he seemed to embrace it in the media. There are and will be other online services to come, I prefer to look to those services as possible referral destinations and “write-off” Betterment. My wife wrote up a review of Betterment about a month ago as well. We’ve been pretty happy with it so far. Very easy to use. Thanks for sharing all the pros and cons here. Does Betterment or any other investing service offer lower rates or deals to service members or veterans? Thanks! Thanks for the info Corey. I have heard of Betterment but for me personally I don’t think I would be able to let go of having direct control over my investments. I can understand that approach, Nick. But, I have a feeling that an automated account will do better than someone who doesn’t know what they are doing (and investing on their own). 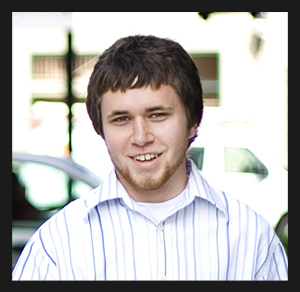 Hi, I’m the founder and CEO of Betterment. @Corey, @Lacy: Thanks for your kind words. Blog reviews and positive customer comments are the highest form of praise for us. You rock. @ Roger: Hello. As a reader of your blog, I know that you and I see eye to eye about what constitutes smart investing. I think we both want what’s best for our customers and the public. We’ve had some productive discussions in the past, and I think we’ve come a long way since then. I’d like to connect to better understand your concerns and give you an update about where we are today. Sound interesting? Shoot me a note at jon@betterment.com and let’s talk. I look forward to continuing our conversation. I recently began investing through Betterment and have been pleased so far. From my experience as a single adult, who has to date, not been very good accumulating any savings, in addition to the features of the service, the biggest benefit to me is that I was easily able to begin the habit of saving while at the same time, giving my money some exposure to the market. I’m sure a CFA could have done the same thing, but the difference is that I hadn’t gone to a CFA, instead I got it done in a night on Betterment with no hassle. I imagine once I accumulate some more savings I’ll want some more individual attention, but for now, I feel like the best savings is the one you do. Portfolio Strategy must be strong.